Thailand's Kiradech Aphibarnrat held his nerve to beat Robert Karlsson by one hole in the final of the inaugural Paul Lawrie Matchplay in Aberdeen. Aphibarnrat had ended the hopes of a home victory by defeating Scotland's Marc Warren 3&2 in the semi-finals. And he went on to secure his second European Tour title of the year. "The next step was to win in Europe, I'm happy and proud of myself," said Aphibarnrat, whose previous wins came in Malaysia and China. The 26-year-old was three ahead with four holes to play, but he lost three holes in a row before winning on the final green at Murcar Golf Links. Karlsson had fired his second shot to within 10 feet, but Aphibarnrat produced an even better approach from heavy rough. And, after the Swede dragged his birdie attempt wide, his opponent holed from four feet for victory and the first prize of £122,000. Aphibarnrat began the final with three birdies in the first four holes. Although an early three-hole lead was back to one at the turn, he drove the green on the short par-four 11th to set up a birdie and won the 14th when Karlsson three-putted from long range. Karlsson, who had needed 20 holes to defeat former Ryder Cup team-mate David Howell in the semi-finals, was handed a lifeline when Aphibarnrat found water with his approach to the 15th green and did not even attempt to take a penalty drop and hole his fourth shot. A par was enough for Karlsson to win the 16th and, when the 45-year-old holed from 10 feet for birdie on the 17th, the match was back to all-square heading down the 18th. 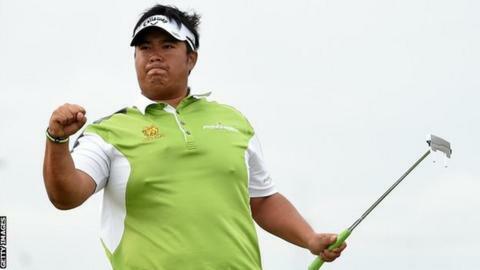 "I was so proud to be described as the John Daly of Asia," Aphibarnrat added. "I was happy with that. He was one of my idols so I studied him. "I remember a long time ago some guy kept telling me that if I had a long backswing like that I would not grow up to be a professional. Today I can show them it is not just the backswing - it is how you hole putts to make low scores." Meanwhile, Englishman Howell defeated Warren by one hole in the third and fourth play-off.